AUSTIN, TX--(Marketwired - Dec 11, 2013) - SolarWinds (NYSE: SWI), a leading provider of powerful and affordable IT management software, today announced its network utilization and bandwidth monitoring solution, SolarWinds NetFlow Traffic Analyzer (NTA), enhanced its performance with increased flow processing speed and detailed one-minute data visibility, providing IT professionals with the highly specific data they need to identify and address network bandwidth problems. SolarWinds NTA provides real-time network utilization and bandwidth monitoring for streamlined reporting of NetFlow, J-Flow, sFlow, IPFIX, and Huwai for Netstream data, enabling IT pros to keep a close watch on network traffic data, identify bandwidth hogs and build customized reports of network traffic. The latest version of SolarWinds NTA has the ability to process 50,000 flows per second or more*, which is 400 percent faster flow processing speed than it had in the previous version. SolarWinds NTA allows IT pros to quickly capture finely granular data from continuous streams of network traffic and convert those raw numbers into simple charts that quantify exactly how the corporate network is being used, by whom and for what purpose, and then allowing them to impede undesirable or hazardous practices. SolarWinds NTA makes it possible to retain one-minute granularity of network traffic data. IT pros can see exactly when an issue occurred which allows them to make a fast and accurate diagnosis of the network traffic issues such as bandwidth spikes or microbursts. IT pros can, then, view the data up-to-the-minute on interactive charts and generate reports on historical traffic usage for any applications, endpoints, or domains over a specified time interval. "With SolarWinds NTA's new ability to show traffic patterns over months, days, or minutes, IT pros can determine when a network issue or anomaly occurs and investigate its source for immediate troubleshooting," said Chris LaPoint, VP Product Management at SolarWinds. "So, for example, if an IT pro checks in after the weekend and sees there has been a questionable network traffic spike on Saturday, he can identify exactly what minute it happened and understand the nature of this traffic in order to get to the bottom of the issue: security breach, impact on application performance, etc." Highlights the IP addresses of top talkers or "bandwidth hogs"
"I've been very pleased with the responsiveness and increased performance in the new SolarWinds NetFlow Traffic Analyzer. The built in Web-based reporting flexibility and ability to create new reports using network traffic data, including both device and flow statistics, is essential in my communication with management," said Damien Ball, senior network administrator, Raleigh-Durham Airport Authority. "I've been a SolarWinds user for over six years and I've been a huge proponent of employing SolarWinds to monitor the networked systems at Raleigh-Durham Airport; it's proven to be a solid and reliable solution." SolarWinds also provides a unique space on its user community, thwack, in which IT pros share device configuration codes, thereby helping others as they prepare to implement NetFlow. This community-driven NetFlow Lab offers IT pros the device, model and code information they need to configure NetFlow on their devices. *Performance of product occurs if the software is deployed as recommended and used with recommended hardware as stated in product documentation. 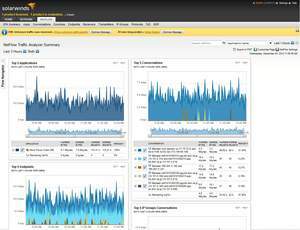 SolarWinds NetFlow Traffic Analyzer pricing starts at $1,795 and includes the first year of maintenance. For more information, including a downloadable, free 30-day evaluation, visit the SolarWinds website or call 866.530.8100. SolarWinds Lab live webinar on Dec. 11 at 1:00 p.m. CST: "Smarter, Better, Faster, Stronger - Flow Storage NTA Takes Traffic Monitoring to 11"
SolarWinds NetFlow Traffic Analyzer allows IT pros to quickly capture finely granular data from continuous streams of network traffic and convert those raw numbers into simple charts that quantify exactly how the corporate network is being used, by whom and for what purpose, and then allowing them to impede undesirable or hazardous practices.